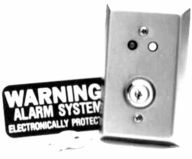 The affordable electronic crime deterrent for home and business – use alone or as a visible addition to an existing alarm system. The Scarecrow® simulates a high-cost alarm system control panel; it looks so authentic even experienced security personnel have been fooled by it. See model DSB-137 Professional on the Order Form. Installs in seconds: no wiring or cutting. All you need is a screwdriver (stainless steel mounting screws included). Precision solid stainless steel construction. Super bright flashing red and green LEDs are bright enough to be seen from the street at night. 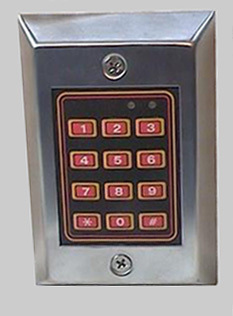 Modeled after the most popular professional key-operated alarm systems, costing $2000 to $3000. Exclusive 2-sided DuoCal ™ warning label included mounts inside glass or outdoors. Battery operated: 2 or 4 inexpensive AAA batteries keep the Scarecrow® DSB-137 on-duty for up to 2+ years, in 24/7 operation. Our best selling deluxe model has a tubular lock with rounded key design (the ultimate in keylock security) and dual LEDs – green and red (red only illuminates). Our Standard Model has a keylock design with dual LEDs. The SB-22 for the economy-minded offers the same high quality, microcircuit controlled security as our Deluxe Model SB-24. Models SB-24 Deluxe and SB-22 Standard on the Order Form. Working key and lock activation system – two keys included. Super bright flashing red LED are bright enough to be seen from the street at night. 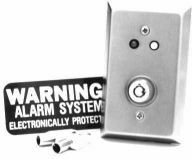 Modeled after the most popular key-operated alarm systems, costing $2000 to $3000. Exclusive 2-sided DuoCal warning label included mounts inside glass or outdoors. Battery operated: inexpensive AAA batteries keep the Scarecrow® on-duty for up to 3 years, depending on keyswitch usage. Square drive screws make removal of the Scarecrow® unit more difficult, requiring a special tool to install or remove. This offers more protection against tampering. See item SDS-2 on the Order Form. Spanner drive screws make removal of the Scarecrow® DSB-137 unit more difficult, requiring a special tool to install or remove. This offers more protection against tampering. See item SPANSCREW-02 on the Order Form. Spanner Screwdriver Tool for Scarecrow® DSB-137 spanner drive screws. Special tool required for use with spanner drive screws. Comes with 2 screws. See item SPANSET-02 on the Order Form.